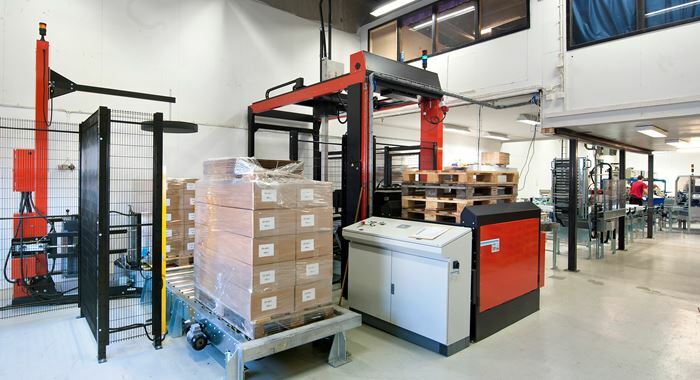 The packaging line includes all processes from case erecting to pallet packing. Umpac AB is located in Umeå in Sweden and manufactures a comprehensive and creative range of quality retail packagings for almost all trades. Umpac customers make heavy demands on quality, precision, and logistics. Umpac’s well-educated and flexible employees and the correct technique fully support these demands. Umpac is under continuous development to meet future demands from customers. Umpac manufacturing is according to ISO quality management system 9001 and according to environmental management system ISO 14001. “Optimum solution from SOCO SYSTEM” Torvald Östensson, General Manager at Umpac AB. With the new packaging line, capacity and productivity are significantly increased giving space to increased turnover. At the same time, the work functions have become more ergonomic and flexible. Another big advantage in connection with the automation is employees having more time to focus on the individual job thus maintaining the high quality level at Umpac. Today, Umpac uses 12 different packings making quick line setting very important. The plan is that also small consignments, including e.g. 10 packings, are to be handled on the packaging line to fully utilise the automation and ergonomics. The line is comprised by SOCO SYSTEM standard modules in close cooperation between Umpac employees and experienced SOCO SYSTEM employees from the sales and project departments. Communication with supplier of labelling and pneumatics was also handled by SOCO SYSTEM. Teamwork and partnership are parts of the equation for making a project of this size successful. The fact that SOCO SYSTEM is a total supplier with own production of all modules in the packaging line was a substantial parameter for choosing SOCO SYSTEM. This ensures full compatibility and no adjustments of products from different manufacturers. Easy availability of service and spare parts in the expected life of the entire packaging line is also an essential factor.